Home / Blog / Advice & Travel Tips / Route Napoleón or Valcarlos? The first section of the Camino Frances across the Pyrenees starts in the pretty Basque town of Saint Jean Pied de Port, in France, and finishes in the city of Pamplona, famous for the San Fermín running of the bulls. The first walking day on the Camino de Santiago, from Saint Jean Pied de Port to Roncesvalles (at 950m of altitude), is probably the most challenging of the whole route. From Saint Jean Pied de Port, there are two possible ways of reaching Roncesvalles: following the so-called Route Napoleón across the mountains or via the town of Valcarlos, down in the valley. Taking the Valcarlos route will mean your ascent will be more gradual and the highest point will be Roncesvalles; while following Route Napoleón will take you higher up in the Pyrenees, to the Col de Lepoeder (at 1,450m), before descending into Roncesvalles. 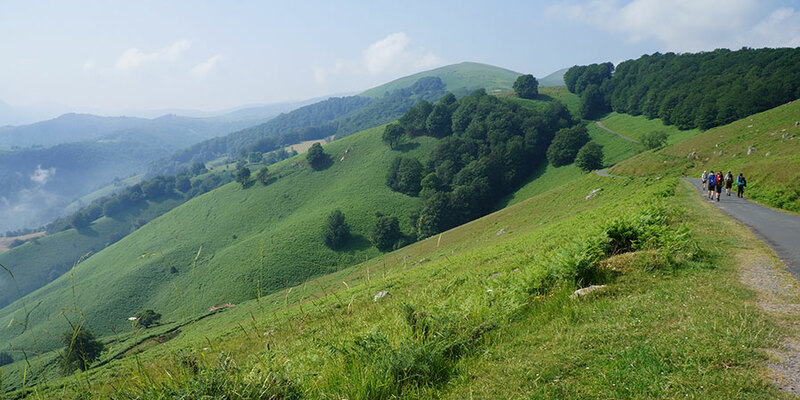 Both options have their pros and cons: Route Napoleón is more strenuous for obvious reasons (it is a constant ascent for 20km and then 5km descent to Roncesvalles) but also the most popular, as pilgrims feel the stunning mountain views are certainly worth the effort. This trail follows mainly tracks and small country roads. We recommend taking this route, weather (and fitness) permitting. Taking the Valcarlos route you will follow more road and less tracks than along the Route Napoleón, but while the ascent is still constant, it will not be as dramatic (950m to Roncesvalles). Walking via Valcarlos, you also have the option to split the 25km walking day in two shorter days, staying the night in Valcarlos. Please note: since 2015, local authorities have decided to close the mountain route across the Pyrenees from St Jean to Roncesvalles from the month of November until the end of March (this could be extended depending on the weather) for safety reasons. Pilgrims looking to walk this section of the Camino Frances during those months will have to take the Valcarlos route. Thank you for your note, Ciaran. We can organise cycling the French Way from St Jean but we would only recommended for very experienced cyclists, as it is a very challenging section. In general we find most cyclists are happy to start from Pamplona. Let us know if you’d like to receive a quote/itinerary and my colleagues in Customer Care will prepare one for you. Kind regards. Hi, I plan to cycle the French way, you offer cycle from Pamplona. is it not possible from the start, Route Napoleón or via the town of Valcarlos? I did the Camino last year aged 67, I am fairly fit but after travelling in from South Africa took the option of a night at Orisson. the next day was then fairly relaxed and arrived in Roncesvalles just after lunch. That 8 Km then the rest was just right. I am planning a self-guided walk along the first section of the Camino is late September. 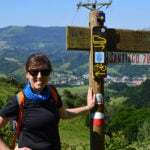 I am 68 years old and had no problem hiking from Sarria to Santiago in May of 2014. I am, however, apprehensive about the Napoleonic route on the first day of hiking. Would you recommend the alternative for me or not at that time of year. I gather it is a very long day and am concerned about running out of time before dark — since I tend to take breaks while hiking. I have booked a tour with Camino Ways starting May 16 from St jean Pied de Port ending in Pamplona. We are both in our 60s and don’t think we can take the Napoleonic route. Is there some way to jumpstart the trip with a ride to Roncevalles? Rather than stay in Valcarlos?